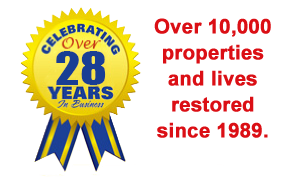 ICC is the fastest restorer in the Twin Cities and Western Wisconsin area. We have restored countless water losses and know exactly what steps are necessary to get you back to pre-loss condition as quickly as possible. ICC will bill your insurance company directly and all necessary work will be performed with as little inconvenience and intrusion as possible. So call our 24-hour emergency line – 888.739.4289 – and we’ll be on our way fast. If circuit breakers can be safely accessed, turn off power in all affected areas. The same should be done for the water shut off valve to stop the flow of water if it can be reached without causing yourself or others harm. If practical, mop up or blot the wet area with towels. Anything that could cause staining on wet carpets or floors, like books or newsprint items should be removed. This also applies to area or Oriental rugs. Remove lamps and items from wood furniture and wipe surfaces down. Wet upholstery cushions should be removed from furniture and propped up in a dry area. Foil or plywood should be placed under furniture legs to separate them from wet carpeting or flooring. Remove all moisture sensitive items from the affected areas and put them in a dry, safe place. Use clothespins to keep furniture skirting off of damp floors and hang draperies that have come into contact with wet carpeting. Hang any affected furs and leather goods to dry at room temperature. If the water did not originate from a clean source and is clearly contaminated, avoid all contact with wet areas. If you have come into contact with contaminated water, wash your hands immediately. Do not spread water from room to room if the wet areas are clearly contaminated. Heating or air conditioning units can spread contaminated air, so avoid turning them on. Do not enter any room where there is an electric shock hazard possible from exposed outlets, switches, circuit breakers or equipment. Do not use any electrical appliance, including ceiling fixtures, while standing on wet carpet, concrete or flooring of any type. 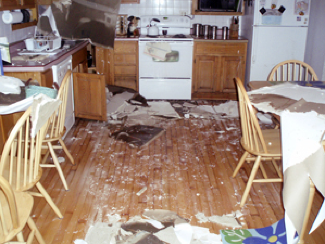 Never attempt to extract water with a household vacuum cleaner or use household fans to attempt to dry the structure. These machines could get damaged or you could suffer an electric shock.